Released in a Digibook with clear trays. Includes a 24 page booklet with liner notes, band photographs and tour information. Tracks marked "previously unreleased on CD": 1-2, 1-4 to 1-7, 1-9, 1-12, 1-15, 2-2 to 2-8, 2-10 to 2-13. Tracks marked "taken from 2014 Rehearsals": 1-6, 1-9, 2-2, 2-8, 2-12. Track 1-1: 1969, Wessex Studios, London. In The Court Of The Crimson King recording sessions. From In The Court Of The Crimson King 40th anniversary CD/DVD-A & In The Court Of The Crimson King boxed set. Track 1-3: 2/3/70 Wessex Studios, London. In The Wake Of Poseidon recording sessions. From 40th anniversary CD/DVD-A In The Wake Of Poseidon. Track 1-4: 9/11/70 Wessex Studios, London. Lizard recording sessions. Previously unreleased on CD. Track 1-5: 8/10/71 Live at the Marquee, London. Forthcoming release, Collectable King Crimson Vol. 7. Track 1-8: October, 1973, Command Studios, London. Larks' Tongues In Aspic recording sessions. Steven Wilson alternate mix, from 40th anniversary CD/DVD-A & Larks' Tongues In Aspic boxed set. Track 1-10: 1/16/73 Command Studios, London. Larks' Tongues In Aspic recording sessions. Edit from Larks' Tongues In Aspic boxed set. Track 1-11: 11/23/73 Concertgebouw, Amsterdam. Steven Wilson 2014 mix. Forthcoming release, Starless boxed set. Track 1-14: 6/30/74 Live at Palace Theatre, Providence, RI. From USA 40th anniversary CD/DVD & The Road To Red boxed set. Track 1-15: 7/8/74 Olympic Studios, London. From Red recording sessions. Previously unreleased on CD. Track 2-1: May, 1981, Basing Street Studios, London. Discipline recording sessions. Alternate take, from 40th anniversary CD/DVD-A Discipline. Track 2-2: May, 2014 Elstree Studios. Band rehearsals. Previously unreleased. Track 2-3: 11/23/81 Live at The Roxy, Los Angeles. Forthcoming release, Beat 40th anniversary CD/DVD-A. Track 2-5: 1983, Bearsville Studios, Woodstock, NY. Three Of A Perfect Pair recording sessions. Steven Wilson mix, forthcoming release, Three Of A Perfect Pair 40th anniversary CD/DVD-A. Track 2-6: 1/27/94 Real World, Bath. THRAK recording sessions. Forthcoming release, THRAKBOXX. Track 2-7: 6/30/96, Live at Shepherd's Bush Empire, London. Previously unreleased on CD. Track 2-8: May, 2014 Elstree Studios. Band rehearsals. Previously unreleased. Track 2-9: October 1998, USA. From West Coast Live, The ProjeKcts box. Track 2-11: 8/7/08, Live at Park West, Chicago. Previously unreleased on CD. Track 2-12: May, 2014 Elstree Studios. Band rehearsals. Previously unreleased. Track 2-13: 2010, Berkhamsted. Jakszyk, Fripp, Collins sessions. Previously unreleased. 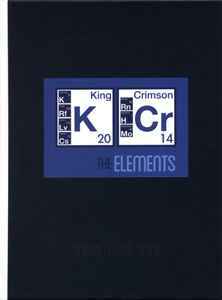 Title variation on booklet: "The Elements Of King Crimson". There are no durations given on the release. This is an awesome box set. I got it at the Seattle show on October 6 and it was the best concert I've ever seen! A great ending to a tour and this is a great box set to add on to the show.